When it comes to divorce, we are your aggressive legal representatives offering expert counsel on a full range of issues, including child custody, spousal support, and domestic violence. Our highly experienced Orlando family law attorneys will do our best to negotiate or mediate a divorce agreement with your spouse outside of the court, but in the case of contested divorces, our experienced litigation attorneys will fiercely protect your interests at trial. Our strong trial attorneys in Orlando are known for dominating any opposition in court. In fact, our impressive record of trial successes can have the effect of encouraging your spouse to agree to a reasonable settlement outside of the courtroom. At The Roberts Family Law Firm, our Orlando family lawyers have the knowledge, resources and dedication required to achieve positive outcomes in the most complex and challenging family law cases. We have a proven record of obtaining positive results for our clients. Our divorce lawyers in Orlando, FL develop an effective plan for successfully resolving your issues, whether they involve divorce, paternity, child custody, alimony, or family law-related appeals, modifications of decrees, or complex property distributions. Most importantly, our attorneys get results for you, thereby ensuring your emotional, legal and financial well-being. We have handled more than 1,300 family law cases and have lost only a handful of trials. Our lawyers have helped thousands of people just like you through some of the most challenging periods in their lives. 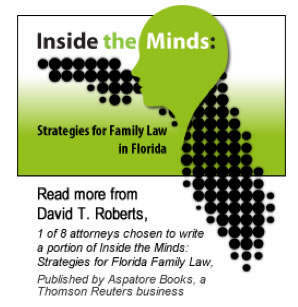 To arrange a consultation with our experienced Central Florida family law attorneys who will protect your interests and advocate fiercely on your behalf, please contact The Roberts Family Law Firm today at (407) 426-6999 or fill out the online form provided on this page and we will contact you shortly. We represent clients in Orlando and throughout Central Florida and have offices in Orlando and Kissimmee. Free parking availble in both locations.